Have you ever experience that “I’m totally on top of things” rush you get when cooking ahead and freezing meals for later? Suddenly, you have home cooked meals ready for work lunches – you can swap that expensive and unhealthy pizza order for something you cooked and froze ahead of time. You’re doing it! You can buy that meat on super-sale and freeze it for a later use – way to save money mama. You’re doing great. Then you’ve probably also experienced that sinking feeling when you clean out the freezer to find that one third of what you’d painstakingly prepared and put away is now expired. That you’d forgotten to use the super-sale meat and now it’s all going in the garbage can. I’m not saying that this has happened to me… but there’s a reason that I made this free meal plan kit! 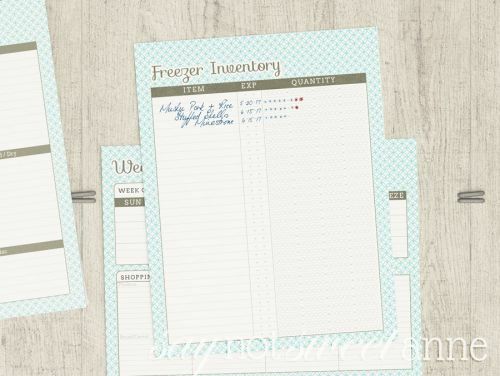 It has everything you need to plan your meals, shop for groceries, and inventory your pantry, fridge and freezer. Don’t let another home cooked freezer meal go to waste! 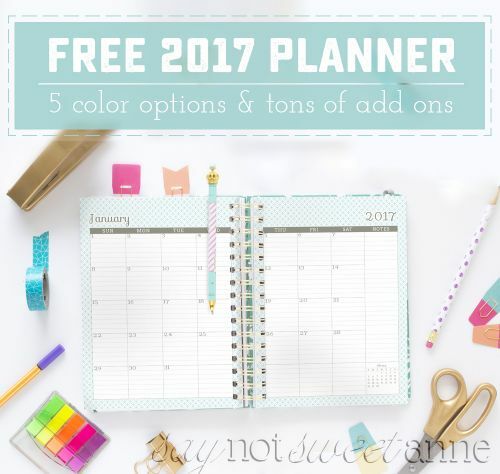 Six color options, to match all of my printable planners and add ons. My favorite part of the kit is the Freezer Inventory. Every dinner I make 2 – 3 times as much as my family can eat. Then, I bag it, tag it and throw it in the freezer. It has saved us hundreds of dollars in fast-food lunches, and it means I’ve always got a home cooked meal ready for when we don’t have time (or the inclination) to cook. This week I’m taking a week off from cooking so that we can eat up some of the stash we’ve gathered. This Free Meal Plan Kit helps me plan out what I’ll make, shop for it, and then keep tabs of how much of a given dish is still in the freezer. Hubby marks them off as he takes them for lunches, and I always know what we have in there. 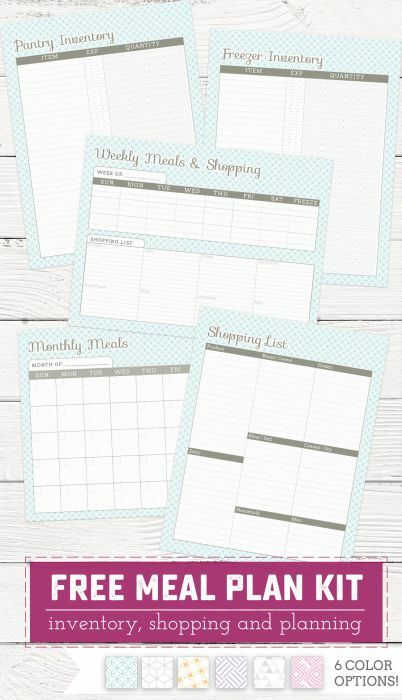 Of course, as always – it matches the 6 designs of my printable planners and add-ons. I’ve made quite a lovely little binder with all my old lists and meal plans – it is perfect to look back on when I need ideas or we’re stuck in a meal rut.